Chandigarh: Anuradha Bali, the estranged wife of Haryana politician Chander Mohan, has been found dead in her bed at her home in Mohali near Chandigarh. The police believes she died four days ago. An uncle spoke to her on July 1; neighbours say they last saw her on July 2.Ms Bali’s body was so badly decomposed that even forensic experts could not bear the stench in the house; they stepped outside to dust a glass for fingerprints. A post-mortem tomorrow is expected to confirm if Ms Bali committed suicide. Ms Bali was the Assistant Advocate General of Haryana when she quit her job and converted to Islam along with Mr Mohan in 2008 so that they could marry legally – he was already married. Ms Bali took the name Fiza and Mr Mohan became Chand Mohammad. The politician had to quit as Deputy Chief Minister and he was also disowned by his father, Bhajan Lal, who has served two terms as chief minister of Haryana. In January 2009, Mr Mohan left Ms Bali, to reunite with his first wife and their children. He then converted back to Hinduism in a ceremony at a temple. Ms Bali had reportedly spent the last few months in deep depression and had repeated fights with her neighbours; the police were called few times to intervene. Yesterday, another Haryana politician, Gopal Goyal Kanda, had to resign after he was named in a suicide note left behind by a young woman named Geetika Sharma who killed herself in Delhi. In her note, she blamed the politician, who was Minister of State for Home in the Congress government, for harassment and cheating. 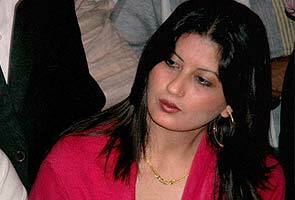 Ms Sharma had worked for MDLR, an airline owned by Mr Kanda. The Congress has asked chief minister Bhupinder Hooda to conduct an inquiry and submit a report on the case to its central leadership.